John Henderson (or Harrison) Claiborne was born on 20 September 1842 in DeKalb County, Tennessee, as the fifth child of John B. and Perlina Claiborne. [United States Civil War Soldier Records and Profiles, accessed through Ancestry.com. See also United States Census records for 1880, 1910, and 1920.] By 1860 the family had moved to Arkansas and on 6 January 1863, while 19 years old, he was conscripted to fight in the Civil War with Company H of the 25th Arkansas Infantry Regiment. [United States Southern Claims Commission, Claim No. 18812, submitted to Congress on 20 December 1875.] According to his father, John did not fight for the Confederacy willingly but was instead forced into service by a conscripting party. The Confederate Congress had passed a conscription law (or military draft) and John appears to have been caught up in it. [The principal conscription law was first passed in April 1862.] The 25th Arkansas Infantry Regiment (then the 30th Arkansas Infantry) had just fought in the Battle of Murfreesboro and suffered heavy casualties that may have warranted drafting new men. 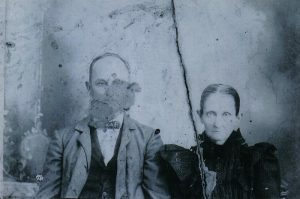 Goodspeed lists the following for him in 1890: “married Mary Ware; the father of six children; living in Texas.”[Ibid.] Thus, he moved to Texas sometime between 1886 and 1890 and appears to have lived at Honey Grove, Texas and later at Sweetwater, Texas. [Claybourn, The Claybourn Family.] On 23 December 1906 John married for the third time, this time to Mary Ethel Waters (called “Ethel”). John was roughly 64 at the time, but surprisingly his new wife Ethel was the young age of 24 (having been born on 27 Jan. 1882), for a total age difference of about 42 years. It was not uncommon for young women in Arkansas to marry Confederate pensioners, though state law was later changed to restrict this practice by limiting eligible widow’s pensions to those born before 1870. 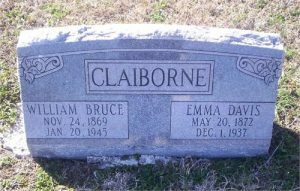 William Bruce Claiborne (called “Bruce”) was born on 24 November 1869 in White County, Arkansas and married Emma Davis Cromer (born on 20 May 1872). They had four children, listed below. [Much of the information concerning this line comes from Shelby Bruce Claiborne, the grandson of William Bruce Claiborne, who spoke with Joshua Claybourn in September 2014.] Emma Davis died on 1 December 1937 in Lamar County, Texas and Bruce followed in death on 20 January 1945. Both are buried in Hickory Grove Cemetery in Lamar County, Texas. William Bryan Claiborne (known as “Bryan”) was born on 28 April 1904 in Texas. William died on 18 November 1983 in Wayne County, Michigan. Morris Shephard Claiborne was born on 20 March 1906 in Lamar, Texas. He married Ella Maurine Cannon (“Mannie”) in about 1928. [Ella was born on 7 December 1907 in Texas.] Together they had two children, listed below. Morris died on 21 July 1979 in Wayne County, Michigan and Ella followed on 24 July 1986 in Arbor, Michigan. Shelby Bruce Claiborne (known as “Bruce”) was born on 22 August 1934. He married Lucy Rhea. Together they had two children. Vicki Lynn Claiborne was born on 6 September 1953. She married Anthony Martin Rach and together they had three sons: (i) Anthony Rach (born in about 1994), (ii) Cameron Rach (born in about 1998), and (iii) Christian Rach (born in about 2004). Stephen Bruce Claiborne was born on 28 June 1957. He had four children: (i) Joshua Paul Claiborne (born 6 January 1986), (ii) Benjamin Rhea Claiborne (born 21 May 1987), (iii) Courtney Elizabeth Claiborne (born 11 December 1989), and (iv) Daniel Claiborne (born 26 January 2004). Betty Claiborne was born on 16 December 1936. She married a man named Peter Frabutt and lived in the suburbs of Philadelphia, Pennsylvania. They had four children together: Michael, Chris, Lorraine, and Kathy. Nancy Elba Claiborne was born on 28 October 1908 in Lamar County, Texas. She married Adolphus Franklin “Frank” Hall (1908-1993) in about 1936. Nancy died on 10 November 1994 in Pasadena, Harris County, Texas. Rosemary R. Hall was born on 17 May 1937 in Gregg County, Texas. She married Tommy G. Hamby (born in 1935) on 20 April 1957. Rosemary died on 28 April 2008 in Pasadena, Texas. Charles Larry Hall was born on 17 May 1937 in Gregg County, Texas, and never married. He died on 20 April 1967 in Tarrant County, Texas. Eddie Louise Claiborne (known as “Louise”) was born on 2 January 1912 in Lamar County, Texas. She married Roy W. Whitlock (1914-1993) in about 1932. Louise died on 24 May 1981 in Dallas, Texas. Sarah Nell Whitlock was born on 2 November 1933 in Lamar County, Texas. She married Elton Smith Gamel Jr. (1925-1976) on 8 October 1966 in Kaufman County, Texas. Linda Sue Whitlock was born on 12 December 1943 in Lamar County, Texas. She married Odia Darrel Breeden Jr. (1949-living) on 13 January 1981 in Rockwall County, Texas. Edgar Smith Claiborne was born in February 1871 in White County, Arkansas. [1880 United States Census, accessed through Ancestry.com.] On 10 December 1893 he married Julia “Belle” Sailor, who was born in 1871 in Lamar County, Texas, to Alvin Emmanuel Sailor (11 February 1842 – 19 May 1891) and Sarah Jane Ragsdale (26 April 1844 – 31 May 1877). [1910 United States Census, accessed through Ancestry.com.] Julia died in 1926 and Edgar followed on 23 October 1948, both in Lamar County, Texas. [State Vital Statistics Unit, 1903-2000, Texas Department of Health, accessed through Ancestry.com.] They are buried in Forest Hill Cemetery in Lamar County. Mattie Mae Claiborne was born on 14 October 1894 in Lamar County, Texas. She married Herschel Edwin Walker (1890-1928) on 19 December 1915 in Fannin County, Texas. Mattie died on 9 April 1987 in Lamar County. Margaret Bell Walker was born on 15 December 1917 in Fannin County, Texas, and died on 1 January 1921 in Delta County, Texas. Hazel Louise Walker was born on 14 December 1919 in Delta County, Texas. She married Buford Wayne Leathers (1921-2011) in Oklahoma on 4 September 1942. She worked for the Pecan Gap Post Office and for Belk Department Store in Paris, Texas. Louise and Buford were members of Calvary United Methodist Church for many years. Hazel died on 4 September 2012 in Parker County, Texas. The day she died would have been her seventieth wedding anniversary. Mertie H. Claiborne was born on 23 September 1896 in Lamar County, Texas, and never married. She died on 24 May 1982 in Delta County, Texas. Bertha Claiborne was born on 11 October 1897 in Lamar County, Texas, and mar-ried Floyd H. Brooks (1899-1968) in about 1924. They had one child, Roy Henry Brooks (28 April 1930 – 31 May 2009). Bertha died on 12 November 1985 in Delta County, Texas. Alvin Harrison Claiborne was born on 7 January 1900 He married first to Agnes Thelma Soens (1902-1926) in about 1924. He married second to Lydia Lee Fagen (1911-1948). [World War I Selective Service System Draft Registration Card, Lamar County, Texas.] It’s likely that Alvin participated in World War I since in 1920, about a year after it had ended, Alvin was stationed in Coblenz-Lutzel, Germany, serving with the 2nd Battalion, 6th Field Artillery, Air Force Group. [1920 United States Census, accessed through Ancestry.com.] Alvin died on 18 December 1951. [California Death Index, Los Angeles, California, accessed through Ancestry.com.] He is buried in Evergreen Cemetery in Lamar County, Texas. Alvin Claiborne Jr. was born on 15 February 1926 to Alvin and Agnes in Fannin County, Texas, but died at a young age on 25 July 1937 in Lamar County, Texas. He is buried next to his mother, with his headstone saying he was born 15 December 1926, which cannot be correct because it is after his mother’s death date. Valda Beatrice Claiborne was born on 3 August 1901 and died on 12 March 1903, both in Lamar County, Texas. She is buried in Forest Hill Cemetery in Lamar County. Flora Bell Claiborne was born on 4 August 1877 in White County, Arkansas. She married Henry Ed Alexander (1878-1955) in about 1903 and they had no living children together. Flora died on 17 October 1961 in Dallas County, Texas. Annie Frances Claiborne was born in April 1880 in White County, Arkansas. She married Robert Gaston Mims (1876-1920) on 8 January 1898 in Lamar County, Texas. Annie died in 1961 in Cotton County, Oklahoma. Eula Bell Mims was born on 4 November 1898 in Lamar County, Texas. She married George Lowery Smart (1893-1970) in about 1924. Eula died on 7 June 1953 in Cotton County, Oklahoma. Willa Tex Mims was born on 9 October 1900 in Lamar County, Texas. She married William Bryan Smart (1896-1973) on 11 May 1919. Willa died on 27 August 1971 in Comanche County, Oklahoma. Thomas H. Mims was born in about 1903 in Texas and died after the 1920 census. Price Cary Mims was born on 9 July 1906 in Texas. He married Rose Lee (1912-1988) and served as a sergeant in the U.S. Army in World War II from March 1941 to September 1945. Price died on 19 January 1978 in Enid, Garfield County, Oklahoma. Nevitt Lee Mims was born on 22 October 1908 in Oklahoma. He married Ella Priscilla McRee (1918-2005) on 21 May 1937 in Wichita County, Texas. Nevitt died on 6 October 1950 in Cotton County, Oklahoma. Lela Frances Mims was born on 15 November 1910 in Cotton County, Oklahoma, and married Seburn Elzie Graham (1911-1963) in about 1934. Lela died on 29 March 2002 in Altus, Oklahoma. Ruth Lovetta Mims was born on 7 March 1913 in Cotton County, Oklahoma. She married Raymond Austin Spratt (1911-1985) on 18 August 1934 in Cotton County, Oklahoma. Ruth died on 29 April 2002 in Altus, Oklahoma. 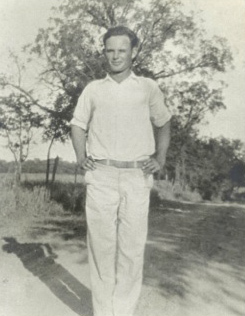 Robert Gaston “Buck” Mims Jr. was born on 3 May 1917 in Cotton County, Oklahoma. He served in the U.S. Army during World War II from September 1941 to November 1945 and married Gladys (1924-1975) in about 1947. Buck died on 23 January 1998 in Harrah, Oklahoma. Marvin Edward Mims was born on 26 November 1919 in Cotton County, Oklahoma. He must have married an unknown woman because two children are listed on his gravestone. Marvin died on 29 August 1963. Georgia Lee Claiborne was born on 19 September 1881 in McRae, White County, Arkansas. She married Thomas Lee Sanders (1886-1963) on 24 December 1911. Georgia died on 15 August 1952 in White County. Annie Mae Sanders was born on 16 April 1914 in White County, Arkansas. She married Mr. Powers after the 1940 census. Annie died on 7 November 1999 in Robeson County, North Carolina. Edith Louise Sanders was born on 7 June 1917 in White County, Arkansas. She married James Wesley “Jack” Floyd (1909-1982) on 7 March 1937 in Saint Francis County, Arkansas. Edith died on 1 January 1999 in Perry County, Illinois. Talbert Leroy Sanders was born on 14 October 1919 in White County, Arkansas. He married Shirley M. Lackey (1921-2008) on 16 October 1943 in White County. Talbert died on 18 July 2001 in White County. Sarah Frances Claiborne was born on 16 August 1883 in White County, Arkansas. [1910 United States Census, Cane, White County, Arkansas, accessed through Ancestry.com.] In about 1905 she married her first cousin DeWitt Franklin Weir, who was born on 7 February 1885.[Ibid.] DeWitt was the youngest son of Sarah’s mother’s older brother William H. Weir (1845-1921) and his first wife Kate Norvell (1846-1886). 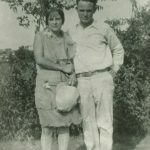 DeWitt died on 11 December 1921 and Sarah followed on 14 August 1930, both in White County. John William Weir (“J.W.”) was born on 7 April 1906 in White County, Arkansas. 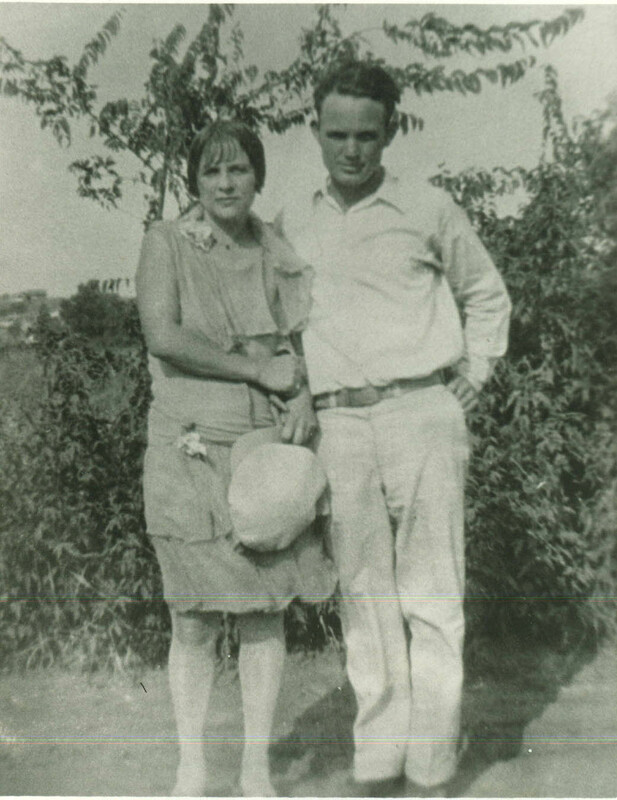 He married Pernecie Maude Stracner (1911-2003) on 19 April 1931 in White County. J.W. died on 4 July 1989 in Pulaski County, Arkansas. Virgil Lee Weir was born on 6 August 1908 in White County, Arkansas. He married Anna Lou Smith (1909-1991) on 18 December 1934 in White County. Virgil died in March 1985 in White County. 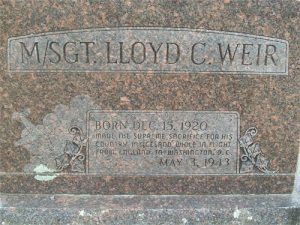 Elton L. Weir was born on 11 November 1912 and died on 18 February 1915, both in White County, Arkansas. Katherine Weir was born on 18 February 1915 in White County, Arkansas. She married Paul B. Tabb (1916-2001) on 31 August 1940 in Saline County, Arkansas. Katherine died on 16 November 1953 in Pulaski County, Arkansas. 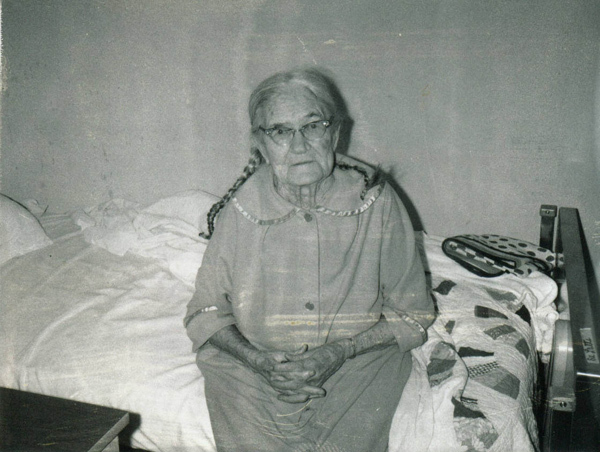 Inez Weir was born on 9 July 1916 and died on 5 June 1918, both in White County, Arkansas. Lloyd Claiborne Weir (known as “George”) was born on 15 December 1920 in White County, Arkansas. In World War II Weir served in Europe with the United States Air Force as crew chief and master sergeant of a Consolidated B-24 Liberator, 41-23728, of the 8th Air Force out of RAF Bovingdon, England. The B-24, nicknamed “Hot Stuff,” was part of the 93rd Bomb Group, 330th Bomb Squadron. Hot Stuff flew its 25th mission on 7 February 1943, against long odds at a time when many planes were being shot down. Hot Stuff became the first heavy bomber in the 8th Air Force to complete twenty-five missions in Europe in World War II and reached its 25th mission three-and-a-half months before the widely celebrated Memphis Belle. After Hot Stuff completed thirty-one missions, it was selected to return to the United States on 3 May 1943, to tour the country and help sell war bonds. In early 1943 Lt. Gen. Frank M. Andrews needed to get back to Washington, D.C. He was Commander of the European Theater of Operations and known as the father of the Air Force. General Andrews knew Hot Stuff’s pilot Capt. “Shine” Shannon and chose to fly back to the United States with him. Although unknown to most at the time, the real purpose of General Andrews’s journey was that he was going back to Washington, D.C., to be blessed by Congress and the president, awarded his fourth star, and formally named Supreme Allied Commander in Europe to lead the assault across the English Channel. Hot Stuff had a scheduled refueling stop in Iceland but crashed into Mount Fagradalsfjall near Grindavik, Iceland, in bad weather on 3 May 1943. Thirteen on board, including George Weir, were killed. Only the tail gunner survived. Because of Gen. Andrews’s death, the job of Supreme Allied Commander was assigned to Gen. Dwight Eisenhower nine months later in February 1944. Additionally, because Hot Stuff was destroyed in the crash, the War Department chose to send the Memphis Belle home and celebrate it as the first bomber to reach 25 missions. Memphis Belle later inspired the making of two motion pictures: a 1944 documentary film, Memphis Belle: A Story of a Flying Fortress, and a 1990 Hollywood feature film, Memphis Belle. The Hot Stuff crew and those on the flight with Gen. Andrews are memorialized online here with stories and several videos. Jim Lux, a friend of a surviving member who had missed the flight the day it crashed, worked hard to memorialize the crew and their history. He led an effort to dedicate a plaque at the site with plans and hopes of a future memorial monument by the wreckage near Grindavik, Iceland. Chester F. Weir was born on 7 October 1921 in White County, Arkansas. He served in the U.S. Army during World War II from June 1942 to December 1945. He married Virginia Burkett (1921-2013) on 14 September 1946 in White County. Chester died on 31 July 1980 in Pulaski County, Arkansas. John Wesley Claiborne was born on 3 April 1885 and died on 30 September 1886. He is buried in Forest Hill Cemetery in Lamar County, Texas. 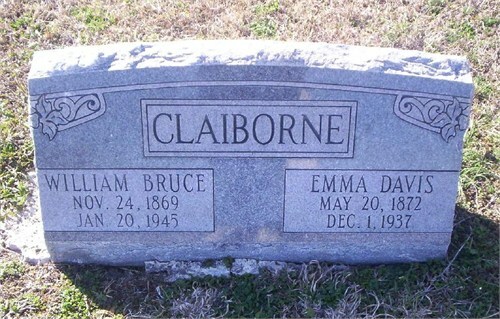 His headstone spells his last name “Clayborne”. William Mary Claiborne (a girl who went by “Willie Mae”) was born on 16 July 1889. She married on 14 February 1919 to Elbert Morris (1891-1970) and they had three children. Elbert died on 08 Jul 1970 and Willie died on 1 June 1985. Vera Gladys Morris was born on 26 April 1920 in Bryan County, Oklahoma. She married Louie Lee Copeland (1919-1997) on 31 January 1945. Louie was a Pearl Harbor survivor from the USS Oklahoma. He served in the U.S. Navy during World War II from July 1940 to July 1946. Vera died on 16 March 1999 in Bowie County, Texas. Pauline Lois Morris was born in about 1923. 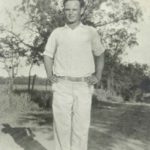 Earl W. Morris was born on 11 September 1924 in Oklahoma and died on 2 December 2002 in Comanche County, Oklahoma. Luther Lloyd Claiborne (a twin to his brother James) was born on 27 January 1907 in Petty (Lamar County), Texas. [Social Security Death Index, Texas, Number: 466-12-9944.] On 29 June 1932 he married Ethel Almeda Barker (called “Meda”). [Meda was born on 29 June 1902.] Together they had three children, listed below. Luther died on 2 August 1990 and Meda died on 7 June 1991. [State Vital Statistics Unit, 1903-2000, Texas Department of Health, accessed through Ancestry.com.] Both are buried in Bethany Cemetery in Grayson County, Texas. Bonnie Zuela Claiborne was born 21 February 1934 in Grayson County, Texas. She married first to Robert Henry Stevens in about 1957 and had two children. She then married Thomas Claude Pennington in about 1960 and had another child. Coy Dean Claiborne was born on 11 January 1936 in Bealls, Texas. [Texas Birth Index, 1903-1997, Texas Department of State Health Services, accessed through Ancestry.com.] He graduated from Sherman High School in 1955 and married Lorene Virginia Harrison. They moved to Longview, Texas, in 1975 and became owner of Auto Parts Mart for almost thirty-five years. Coy was an avid dirt track racer and enjoyed watching NASCAR. He died of cancer on 8 September 2015. Michael Coy Claiborne was born on 22 February 1958. He married Rose Wilkerson and they had one daughter. Michael died on 11 October 1999 in Longview, Texas. Chandra Elaine Claiborne was born on 25 September 1979. She had three daughters: (i) Brittany Shyanna Larson was born on 18 April 1997, (ii) Casey Nichole Claiborne was born on 31 July 1999, and (iv) Ella Faith Moen was born on 14 January 2011. Jeffery Scott Claiborne was born on 26 March 1964 in Sherman, Texas. He married Laura Bess Isenhower and they had one son. He worked for Nieman Marcus in Longview, Texas. Jeffery died on 27 January 2002 in Longview, Texas and is buried there at Memory Park Cemetery. Kevin Scott Claiborne was born on 2 July 1991. Christie Coylene Claiborne was born on 20 June 1971 in Sherman, Texas. Carlie Savannah Davis was born on 17 April 2002. Alexa Paige Claiborne was born on 13 February 2006. Ella JoAnn Claiborne (known as “JoAnn”) was born on 11 June 1942 in Grayson County, Texas.[Ibid. ] She attended Sherman High School in Sherman, Texas and then attended Baptist Bible College. She married John Harry Arnold. [John Arnold was born on 11 Oct 1942 in Mckees Rock, Pennsylvania.] Together they had three sons, listed below. John Gregory Arnold was born on 13 August 1963 in Sherman, Texas. On 14 August 1982 he married Lori Hendricks. [Lori Hendricks was born on 21 April 1963 in Collin, Texas.] That same year they joined the family business at Coldwell Banker Apex, Realtors. The affiliate was started by Lori’s mother Millie Hendricks in 1973. [Lori’s great, great-grandfather, James Asbury Hendricks, was one of the first settlers in the Collin County area and is recognized in many local history books on the region.] Together they grew the business to regional and national prominence. In 1990, the company was a one office operation with no national affiliation. By the 21st century the company had 9 locations with over 400 associates serving the Dallas and Fort Worth area and was recognized as one of the leading real estate firms both locally and nationally. Jason Scott Arnold was born on 29 April 1986 in Heath, Texas. He attended Dallas Christian School (class of 2004) and Southern Methodist University (class of 2008). In August 2010 he joined his parents and worked with Coldwell Banker Apex, Realtors as Director of Operations. On 10 July 2015 he married Christine Halbert. Joshua Ryan Arnold was born on 19 August 1990. He graduated from Baylor University in 2012 with a business degree and then attended Baylor University Law School. Blake Daniel Arnold was born on 30 October 1997. Colton John Arnold was born on 19 May 2000. Stephen Mark Arnold was born on 21 September 1973. He married Tammy Lynn Haney on 19 December 1998. [Tammy Haney was born on 18 August 1975.] Together they had two children. Jenna Elizabeth Arnold was born on 21 June 2005. Caden John Arnold was born on 11 November 2008. James Lowry Claiborne (“Charley”) (a twin to his brother Luther) was born on 27 January 1907 in Petty (Lamar County), Texas. He served in the U.S. Army and suffered some sort of injury because he is list in the 1930 census at Fitzsimons Army Medical Center in Adams County, Colorado. Charley died on 31 May 1988. [Social Security Death Index, Texas, Number: 457-14-2893.] He is buried in Bethany Cemetery, Grayson County, Texas. Everett Woodward Claiborne (“Woodard”) was born on 10 December 1909 in Lamar County, Texas. He married Margaret Howell (1918-2012) in about 1938 in Texas. They moved to Fresno County, California, by 1945, where he died on 28 September 2011. Nancy Anne Claiborne was born on 15 August 1945 in Fresno County, California. Timothy Edwin Claiborne was born on 17 April 1953 in Fresno County, California. Mattie Maude Claiborne was born on 29 February 1912. [Social Security Death Index, Texas, Number: 451-28-5414.] She married Leonard O. Rolen, who was born on 15 March 1910. [1920 United States Census, Justice Precinct 1, Grayson County, Texas, accessed through Ancestry.com.] They lived in Pueblo, Colorado, from about 1939 to 1945, but eventually they returned to Texas and had two more sons. Leonard died on 9 August 1987 and Mattie followed on 4 January 2002. [See Mattie’s Social Security record referenced above. For Leonard’s death, see Texas Death Index, 1903-2000, Texas Department of Health.] Both are buried in Bethany Cemetery in Grayson County, Texas. Mary Frances Rolen was born in about 1929 in Grayson County, Texas. She married Chester Gene Heartsfield in about 1947. She died on 13 July 1987 in Tarrant County, Texas. Charles Edwin Rolen was born on 22 September 1934 in Grayson County, Texas. He joined the Army at age seventeen, serving in Korea and Vietnam. For twenty years of his military service, he was stationed in Germany under the European Command. He was listed on the Department of Veterans Affairs Agent Orange List and his family believed his exposure to agent orange in Vietnam later caused him to suffer from a form of dementia. While in Korea and Vietnam, he established orphanages and was later honored when a South Korean hospital was named the Charles E. Rolen Memorial Hospital. While in Germany, he met a German-born woman named Sylva (1934-2004) at a snack bar. He pursued her for nine months, but she kept turning him down. His luck changed when he asked Sylva to go to a “kiddie matinee” to see “Snow White and the Seven Dwarfs.” She finally gave in and three weeks later they were married in 1957. Eventually Charles retired from the military and the family settled in Texas. Charles’s daughter Gabriela said of her father, “He was a soldier, but when he came home he was a husband and father. He was a lot of fun. My dad worshiped and adored me and my mother.” On Saturday mornings Charles, his wife, and their daughter danced to Dean Martin music while in their pajamas. Charles went into business with his daughter and in 1987 the team opened DFW International Network, a talent agency in Euless, Texas. Through this they encountered many celebrities and provided movie extras and models. Charles’s outgoing and humorous personality helped. Charles died on 4 January 2004 in Tarrant County, Texas. He and Sylva are buried together in the Dallas-Fort Worth National Cemetery. Leonard Phillip Rolen was born on 22 October 1945 in Dallas County, Texas. Timothy Rolen was born on 22 August 1952 in Dallas County, Texas. John Dee Claiborne was born on 4 November 1914 in Petty (Lamar County), Texas. [California Death Index, 1940-1997, Fresno, accessed through Ancestry.com.] In the 1940 census, he is in Webster County, Louisiana, working in a paper mill. He married in about 1942 to Elizabeth O’Dell (1921-2012) and moved to Fresno County, California, where he died on 10 January 1997. John Horrel Claiborne was born on 3 January 1943 in Fresno County, California. Gary Duane Claiborne was born on 6 December 1944 in Fresno County, California. Karen Sue Claiborne was born on 29 August 1946 in Fresno County, California. She married Mr. Stover and had two sons. She died on 28 September 2011 in Topeka, Shawnee County, Kansas. Jeffrey A. Claiborne was born on 22 September 1959 in Fresno County, California.